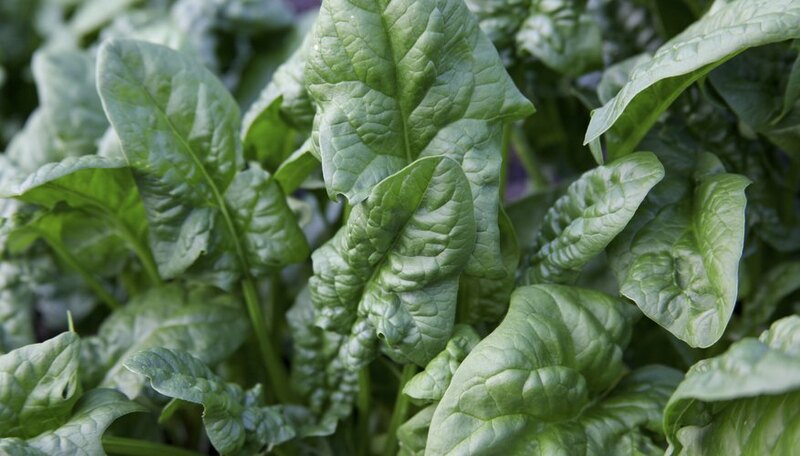 Give true spinach a location with full sun and well-drained soil with near-neutral soil pH. Direct sow seeds into cool spring soil as soon as soon as the garden can be worked. Sow again every two to three weeks for successive harvests. Water throughout the growing season, so soil stays consistently moist. Mulch spinach plants to conserve moisture and stabilize soil temperatures. Spinach's shallow roots dry out easily, and heat encourages bolting -- when plants flower prematurely and set seed, and leaves turn bitter. Plant again in late summer for fall harvests. Some spinach varieties excel during certain seasons, regardless of type. Varieties prone to bolting do best when grown and harvested in cool seasons, while bolt-resistant varieties perform well during warmer months too. Five types of true spinach are widely cultivated, along with a few imposters that ride along on the name. 'Corvair' spinach (Spinacia oleracea 'Corvair'), with very dark green, smooth, oval leaves. Slow to grow and slow to bolt, it does well sown in spring for summer harvests. (Spinacia oleracea 'Gazelle') has smooth, dark green leaves. Fast growing and quick to bolt too, it's good for late summer and fall plantings, and harvests from fall through spring, where growing conditions allow. 'Kookabura' spinach (Spinacia oleracea 'Kookabura') with dark and deeply crinkled, rounded leaves -- it's a fast grower with average bolting tendencies. It does well for both spring and fall planting, with harvests in early summer and again in fall to early winter. 'Harmony' spinach (Spinacia oleracea 'Harmony') is a fast-growing, early season variety that resists bolting. The heavily puckered, dark greens are very flavorful. (Spinacia oleracea 'Emperor') with dark green leaves and moderate growth paired with moderate bolting speed. It does well in late-summer and fall plantings, with harvests through spring, where conditions allow. * 'Reflect' spinach (Spinacia oleracea 'Reflect') offers medium green leaf color with a slight pucker. Slow to bolt, this medium-rate grower excels when planted in cool spring right through summer into cool fall. 'Red Kitten' spinach (Spinacia oleracea 'Red Kitten') has smooth, medium green leaves with dark, burgundy-red, upright stems and veins. Fast to grow and fast to bolt, this variety suits cool fall planting best. Harvests continue through late winter to early spring. 'Bordeaux' spinach (Spinacia oleracea 'Bordeaux') delivers very dark green, red-veined leaves. It grows and bolts fast, but has an excellent, sweet flavor. Plant it in spring and again in fall. 'Flamingo' spinach (Spinacia oleracea 'Flamingo') has dark, green, arrowhead leaves and is fast to grow but not fast to bolt. Plant in spring, through summer and into fall, and enjoy harvests from late spring through to the following early spring. 'Summer Delight' spinach (Spinacia oleracea 'Summer Delight') is highly heat-tolerant and slow to bolt. It offers thick, dark green leaves that excel in spring and summer plantings. It's a great choice for warm climates. New Zealand spinach (Tetragonia tetragonioides) is a warm-season green that tolerates hot summers and brings traditional spinach taste to the table. Red Malabar spinach (Basella rubra), also known as Ceylon spinach, is a vining, heat-tolerant green that looks beautiful on a trellis or arbor. The red-stemmed and red-veined beauty looks and tastes like a cross between spinach and chard (Beta vulgaris var. cicla).